Gorkha Janmukti Morcha supporters have torched a Block Development Office in Bajanbari area and a PWD office in Lebong area of Darjeeling as the Hills remain tense amid an indefinite bandh called by the GJM for a separate Gorkhaland and against the alleged imposition of Bengali language in schools. There is heavy deployment of police and CRPF in the area, especially outside the district magistrate’s office. GJM supporters reportedly set ablaze a PWD office in Lebong area. The flames were doused by fire services personnel, but the building suffered extensive damage. The culprits soon fled the spot. No arrests have been made yet. 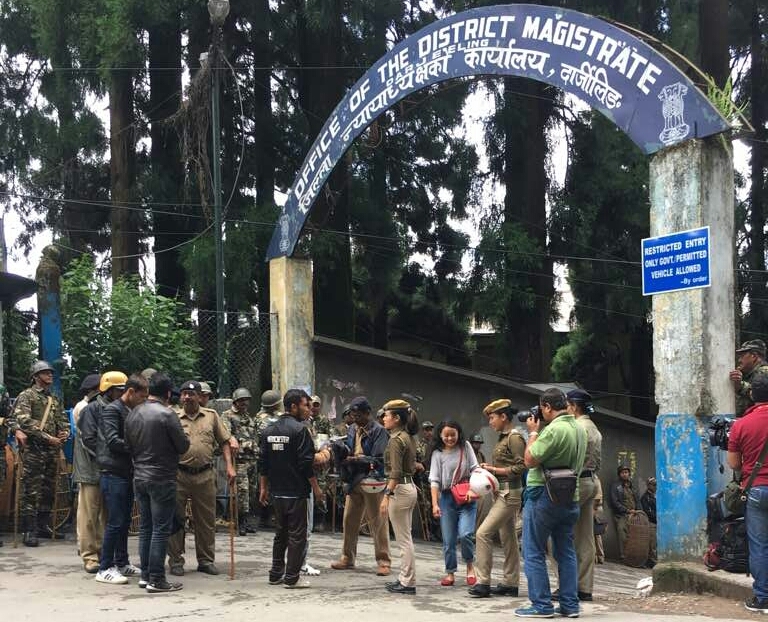 GJM supporters also tried to shut down a Panchayat office in Darjeeling but the situation was brought under control by the police, reports News18.com’s Sujit Nath. GJM supporters reportedly tried to torch shut down and torch a government office building, but the situation was brought under control by the police. GJM general secretary Roshan Giri told News18 that the buildings were torched by TMC supporters who were now blaming the GJM. Local Trinamool Congress leaders are encouraging people to attend office. CM Mamata Banerjee has enquired about attendance in offices, reports News18.com’s Sujit Nath. GJM general secretary Roshan Giri says the party will "appeal" to the people to participate in the bandh and not go to offices. "We will appeal to the people not to go to offices and make our bandh successful. We will hold a torch rally later in the evening," Giri tells PTI over phone. Police pickets, barricades have been placed in front of government offices, Gorkhaland Territorial Administration (GTA) offices and RAF and a sizeable number of women police personnel have been deployed, Darjeeling District Magistrate Joyoshi Dasgupta told PTI. "The administration will act as per the law if anybody is found forcing others as well as establishments to participate in the bandh," the DM said. She said that the Army was present in the hills as a "backup". Eight suspected GJM activists have been detained for indulging in arson. Several hotels have been closed and very few vehicles are on the roads. Toy Train services have been suspended, reports PTI. Most eateries, shops, markets and private offices downed their shutters and GJM party flags were seen fluttering all over the hills. Section 144 has been imposed outside government establishments in Darjeeling. While the GJM has warned employees to stay away, the government has ordered them to turn up for work. GJM supporters have reportedly torched a Block Development Office (BDO) in Bajanbari area of Darjeeling. There is massive police and CRPF deployment outside government offices, especially the District Magistrate’s office. Government employees have turned up for work, but the situation is tense. Violence had erupted after GJM supporters tried to break the police barricades and march to the venue of the cabinet meeting to protest the "imposition" of the Bengali language in the schools in the hills. The hill town had remained peaceful for several months as the GJM-led agitation for a separate state of Gorkhaland had taken a backseat. The Army was deployed in Darjeeling, Kalimpong and Kurseong after GJM supporters clashed with the police, damaged police vehicles and set some of them ablaze as Banerjee held a cabinet meeting at the Raj Bhawan here on June 8. The Mamata Banerjee-led Trinamool Congress (TMC) won the Mirik municipality in the recently-held civic bodies polls in the Hills and also opened accounts in the towns of Darjeeling, Kurseong and Kalimpong, a first for any political party from the plains in many years. The unrest comes a month before elections to the Gorkhaland Territorial Administration, which is currently run by the GJM. This will be the first time the GTA completes a five-year term. GJM chief Bimal Gurung has asked tourists to leave the Hills because of the possibility of "untoward" incidents. The shutdown today comes three days after the GJM called a 12-hour bandh in the Hills. The picturesque north Bengal town, known the world over for its tea industry, witnessed large-scale violence. GJM supporters and workers had clashed with the police and set ablaze several government vehicles. "All state government offices in Darjeeling and Kalimpong districts will remain open and all employees should report for duty on each day till such bandh is not withdrawn…. Any absence will be considered as a break in service and no salary will be admissible unless covered by reasonable grounds," a government notification said. The GJM, a BJP ally, has called for an indefinite shutdown of state government and Gorkhaland Territorial Administration (GTA) offices, but kept educational institutions, transport and hotels out of its purview. To counter the bandh, the Trinamool Congress government has ordered all its employees and those of the institutions receiving grants-in-aid from it to attend office on all days till the agitation continues, warning that absence from duty will be considered a break in service. The bandh has been called by the GJM to press for a separate Gorkhaland. The movement has been fuelled by anger over an alleged move to make Bengali language compulsory in schools. Darjeeling is bracing for a fresh confrontation between Chief Minister Mamata Banerjee and Gorkha Janmukti Morcha (GJM) chief Bimal Gurung as an indefinite shutdown called by the GJM in the Hills gets underway today.